Trees for Missoula seeks to improve our City’s environment, build community and connect Missoulians with the natural world and each other through a wide variety of projects. When Trees for Missoula (TFM) started meeting in 2011, it was soon realized that there was no easy answer to that question. It was estimated that the City of Missoula Urban Forestry Division (UF) had 30,000 street trees to care for with limited staff, equipment and resources. However, with only a partial inventory from 2003, there was insufficient information to garner city council support. In 2012, TFM and the UF received a Department of Natural Resources and Conservation (DNRC) program development grant to pay for two interns and TFM donated two Trimble GPS units to UF for the inventory. For 14 weeks in 2013, three certified arborist UF staff, 24 TFM volunteers and two interns walked, mapped and evaluated over 24,000 public street trees. Since then, UF staff have continued to inventory Missoula’s trees. 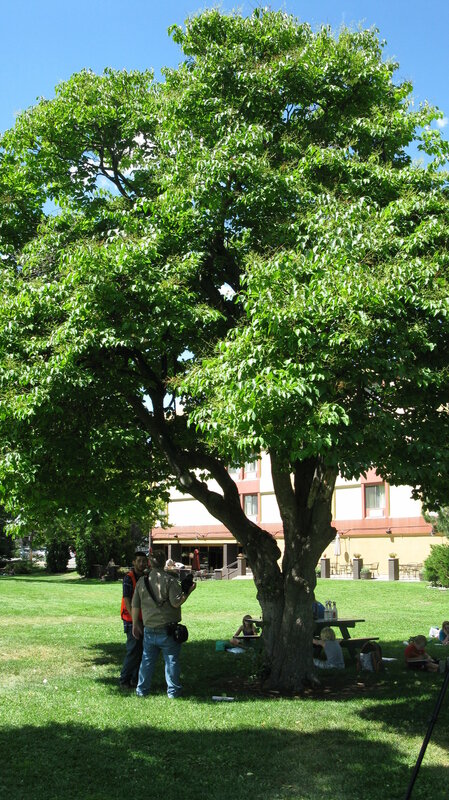 As of May 2018, almost 29,656 pubic trees within city right-of-way and in parks have been mapped, evaluated and inventoried. In 2018, TFM and UF are planning a 5-year inventory update. If you are interested in volunteering for this project, please fill out the volunteer form. Under this concrete is Montana’s first suspended pavement system. Unlike traditional tree wells, this system provides space for non-compacted soil, which gives roots the necessary room to grow, along with oxygen, water and nutrients vital to support a large and healthy tree. Every tree that takes root carries with it a myriad of benefits to our health, quality of life and well-being – locally and globally. In December 2015, Trees for Missoula (TFM), the City of Missoula Urban Forestry Division (UF) and Missoula Art Museum received a Department of Natural Resources and Conservation (DNRC) Program Development Grant to install a suspended pavement system at the Missoula Art Park. October 2016, Montana’s first suspended pavement system was installed along with a Pacific Sunset Maple. The following graphic and text describing the system are on the sign adjacent to the tree at the Missoula Art Park. More people will get outside and exercise if there is easy access, places to rest and pleasant destinations to reach. With these factors in mind, Trees for Missoula (TFM) with partners Climate Smart Missoula and Missoula InvestHealth began looking for a location, and found it along the Bitterroot Trail at S. 6th St. W.
In 2017, TFM received a Department of Natural Resources and Conservation (DNRC) Program Development Grant for a shade project that includes the installation of a shade shelter built from reclaimed lumber, large shade trees, native grasses and an irrigation system. With TFM partners City of Missoula Urban Forestry Division (UF), Climate Smart Missoula, MMW Architects and HomeResource, the shade project will be installed spring/summer 2018.